Back in October, 2012, I gave a presentation to the Economic Club of Sheboygan titled "The Reluctant Recovery." Almost 2 ½ years later I can reread my comments and conclusions about the presentation and not find much to fault or change. This says it all, and it is a mantra I have repeated continously ever since: "although this is the weakest recovery in generations, with a few exceptions the economy has undergone some significant adjustments and is continuing to expand, although growth is likely to continue to be rather slow and disappointing until and unless we get significant improvement in fiscal and monetary policy." Further, "the recovery has been a reluctant one, because the market has from the very beginning been reluctant to embrace the notion that the recovery was real and durable, much less robust. There are plenty of good reasons for the market to be concerned, of course: unprecedented changes in monetary policy, misguided fiscal stimulus, the deep-seated problems in the Eurozone, the housing disaster, and the huge federal deficit, among others. The fundamentals have improved, but market sentiment remains pessimistic. This creates an interesting environment for investors, since it means that the bar for economic performance has been set very low: the economy only needs to avoid a recession for markets to react positively." 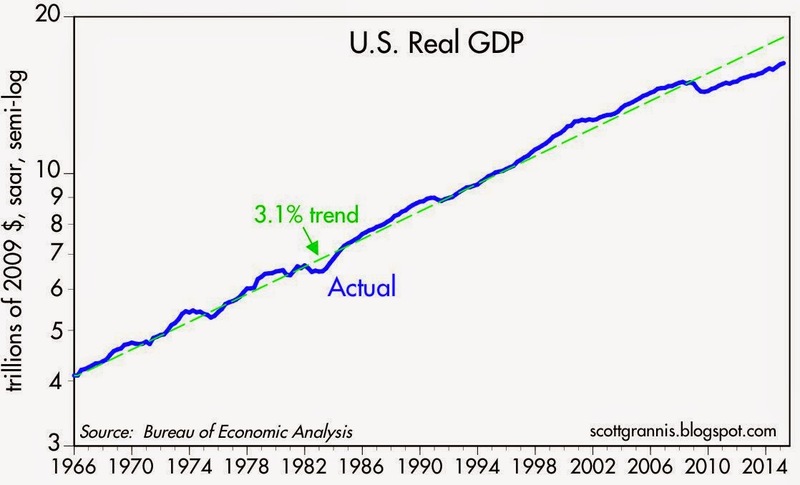 The chart above perfectly summarizes the problem that has persisted for the past 6 years: disappointingly slow growth. The economy is 10% or more below where it could have been if this had been a "normal" recovery. We are missing out on almost $2 trillion per year in annual income, and that's not insignificant. Although the same themes of "reluctant recovery" apply today, valuations have improved and so stocks are not as cheap as they used to be. 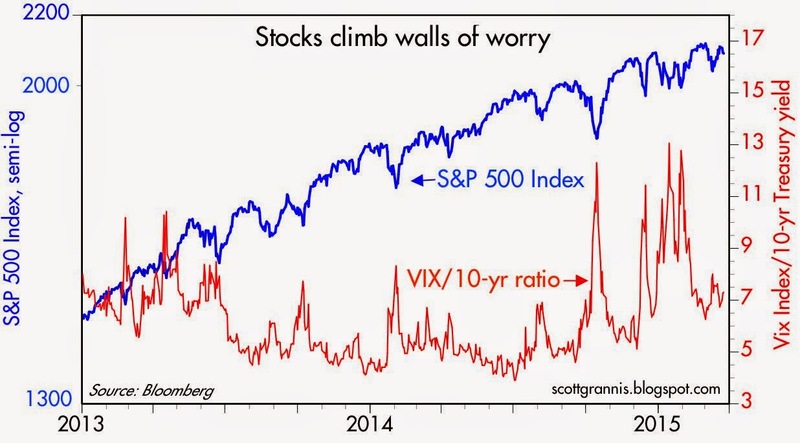 This has led to repeated bouts of angst that the market has struggled to overcome: "climbing walls of worry" has been a theme since last October. 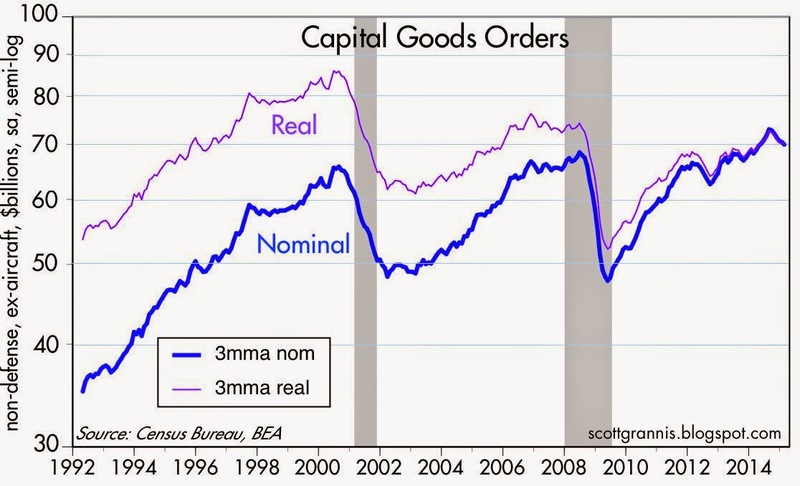 This morning's Capital Goods Orders was weaker than expected, but it fits within the theme of "reluctant recovery." One reason the recovery has been disappointingly slow is that businesses have been reluctant to invest, even as corporate profits have reached record levels. Investment might be a lot stronger if we cut or—better yet—eliminated the corporate tax rate. That it is manifestly too high can be seen in the roughly $2 trillion in corporate profits that have not been repatriated. 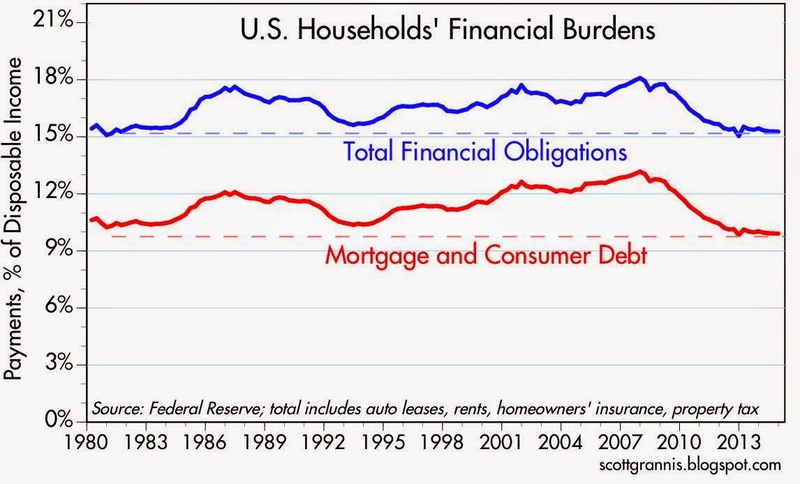 A few days ago the Fed released its estimates of household financial burdens as of the end of last year. Households have undergone some significant deleveraging since prior to the Great Recession, but on the margin not much has changed for the past few years. I think this is a sign that caution still reigns; people are reluctant to go on a borrowing binge, preferring instead to accumulate savings and keep their powder dry. It's a time of prudence. Nobody is taking outsized risks these days. "Once burned, twice shy" is still an apt description of the mood of risk-takers. But all of this is not a reason to be pessimistic. On the contrary, it's a reason to remain optimistic. There is still a tremendous amount of untapped potential out there, if only policies could move in a more favorable direction. Policies need to be designed so that they increase the after-tax rewards to working and investing and taking risk. It's that simple: we need to cut marginal tax rates on income and investment. Moreover, we need to continue the favorable trend in fiscal policy that has prevailed for most of the past six years: federal spending needs to grow at a rate slower than nominal GDP, so that the burden of spending (which as Milton Friedman taught us is really the burden of taxation, since all spending must eventually be repaid by taxation) continues to fall. One other important reason for why this has been a reluctant recovery is that government tax and regulatory burdens have been exceedingly high. Things are improving on the margin, as federal spending declines as a share of GDP, but we've got to slash the size of the Federal Register. Starting and running a business is simply too difficult these days. I should know, since I would face a marginal tax rate of 65% or so if I decided to charge money for viewing this website. Readers will be happy to know that I prefer to work for free rather than give the government two-thirds of the fruits of my labor. "Readers will be happy to know that I prefer to work for free rather than give the government two-thirds of the fruits of my labor." An argument for higher taxes if I ever heard one, lol. Can't say enough how good your blog is, thanks Scott. One way or another, we have to find money for our crumbling roads and bridges, and her second-rate airports. We are all indebted to you Mr. Grannis. I'm not sure how that affects by household balance sheet, but that debt as a % of GDP is high and getting higher every time you post. Thanks for your continued 'free work' Scott. You are my daily macro insight! Wells Cap Jim Paulson: A Productivity Problem? 2.4% annually. However, in the shadow of the 1990s technology bubble, productivity has stalled during the last decade. As shown in Chart 8, since late 2011, the stock market and productivity have exhibited an uncommon divergence. Stock prices have continued to rise despite significantly weak productivity growth. What does this divergence suggest? Wall Street can’t say it hasn’t been warned. Margin debt levels at half a trillion dollars at the end of 2014, as well as corporate debt levels estimated at $7.4 trillion are alarmingly high, argues Berg, saying “..forced sales of equities by large leveraged investors at the margin could be a catalyst that sparks a larger selloff”. As to corporate leverage, debt proceeds have largely been used for stock buybacks, dividend increases, and mergers and acquisitions. “Once the cycle turns from expansion to downturn, the buildup of past excesses will eventually lead to future defaults and losses,” he writes. For an answer to why productivity has been so weak and the recovery has been so anemic, I highly recommend re-reading my post of last August: "What happened to all the profits?" Thanks Scott, you're a legend! Excellent blogging. But I am not sure the stock market is pessimistic. 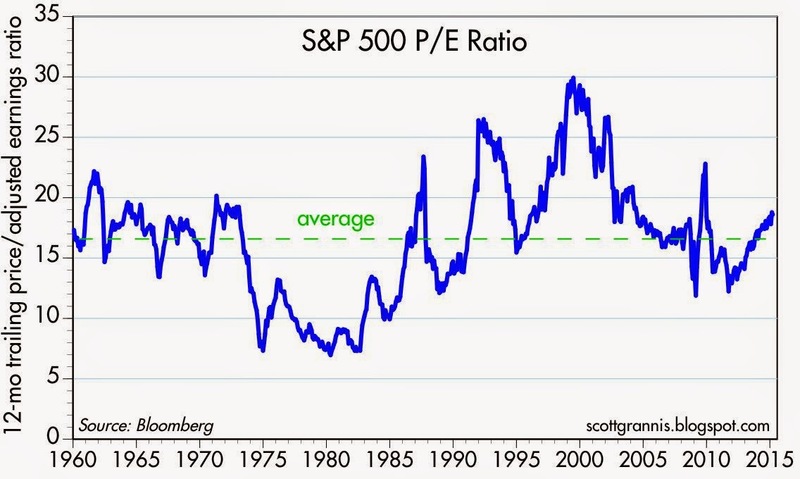 The p/e ratios seem to be within historic norms, perhaps even a trifle high. Ergo, I think the stock market is reasonably optimistic. Side note: do we see Treasuries go to 0% percent yield? If the dollar stays strong, we may see capital flow to the United States. It would be nice to eliminate the corporate income tax, but I think an even better tax cut is too radically reduce FICA taxes.